So first thing tomorrow morning (Friday) it's bye bye time to another car. I'll be dropping the squished-up Smart Roadster off at the fleet workshop - where a careful eye will inspect its every panel and cavity to ensure its in no worse condition that when I collected it in January. Should I pour water over the seats to recreate the wet-bum sensation I lived with for the first month or so? Probably best not to. Then it's off to Charles Hurst (which still feels like it breaks some fundamental law of the universe) to pick up the new car that should be waiting for me. Oh, and there's some kind of financial transaction to complete - thank goodness pay day was this week! So the new car doesn't have heated seats, automatic lights and wipers, electric mirrors, automatic transmission or cruise control! 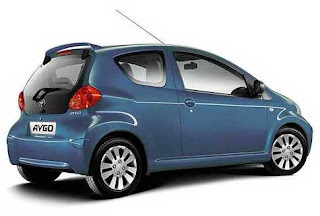 But it's cheap, fuel efficient, has a boot that you can fit more than a sandwich in, doesn't sound (inside) like you're driving a tractor ... and I'm hoping that it won't have the same tendency to ice up the inside of the front windscreen! Feels like there's always a snag. And this time I'm hoping that it's not a second key kind of snag. Perhaps the insurance woes will have covered it. I arranged the insurance pretty speedily last Friday on the phone to Hughes in Newtownards. Got a good quote, paid the money by credit card and they promised to send out the paperwork asap since I need a cover note in my hand to pick up the car from the dealer in the morning. Anyway. Monday. Tuesday. No envelope in the post. Was in London yesterday. So it was this morning when I rang Hughes to ask if they'd actually processed the insurance and where they'd posted the cover note to. "It was posted out on Monday ... usually go first class ... so it should be there by now. Maybe it'll arrive today. Could you call and collect a duplicate today [from Newtownards]?" Since I need something looking like a cover note in my hand in the morning, I asked for them to fax it across to work. I felt let down. Until now, Hughes have been incredibly straightforward, and I've used them regularly since I bought the Polo ten or so years ago. Got home. Chunky envelope from Hughes sitting in the kitchen. The date at the top of the cover letter. Tuesday. So it wasn't posted out on Monday. That was a lie. And that was when I got cross. When something goes wrong, customer service is all about honesty and openness. Not telling porkies - whether deliberately or not - that are later found out to have no basis in fact. Begs the question what Hughes were doing between last Friday morning when I got off the phone at 9.15am and when their laser printer spewed out the cover note on Tuesday and someone popped it into the post. Anyway, the first part of tomorrow morning will be spend zooming around greater Belfast in the great car swap. And don't forget, in the spirit of driving smaller and smaller cars, this one will be a smidgen shorter than the last one, since when you breath in, the Aygo is 3.410m compared to the Roadster's 3.427m. 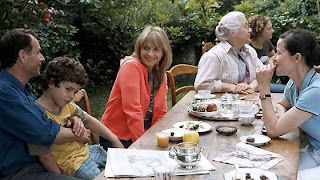 Written and directed by Olivier Assayas, it’s a story of siblings who have grown up and are leading very different lives. Until now, they have been returning to their mother’s home in the rural outskirts of Paris twice a year. But their jobs are making some of them spend more time in New York and China. The film starts with noise and bustle as they gather along with their children to prepare for their mother’s birthday party. I should point out that I attended an animation training workshop on the morning of the day I saw this film, so film grammar and shot types were front of my mind as I watched from the back left of the Curzon Soho’s screen 1. Hélène (Edith Scob), the mother, is a complicated character. She accepts each birthday present with a complaint, before opening them and giving a vague apology afterwards. The cordless phone set, never unboxed, haunts the film like a ghost. With the past so obviously haunting the present, she makes plans so that it will not haunt the future. With her passing years, she is conscious of her legacy – the burden of the collection, as well as her true relationship with her uncle – and starts the conversation to help her children know how to pass it onto museums and auction houses. The mother dies in the cut between one scene and another. There’s no announcement. It just happens and it’s obvious from the action. George Williamson’s review on Eye for Film suggests that the three children now in their forties fulfil the roles of sentimentalist, realist and capitalist. The oldest son, Frédéric, is the only one living in France. He’d keep the collection as a family museum for them all to return. His instinct is to procrastinate and to hold onto the past in order to pass it onto their children to decide. Juliette Binoche looks impossibly young playing Adrienne, with striking dyed blonde hair and wearing a vivid orange fleece. She’s got her great uncle’s flair for design and art, and although she can recognise and date older pieces, her passion is for modern, contemporary design. She sees the collection as a curse that should be sold off. The youngest brother, Jérémie, is taking a chance with his career and basing the family at a sports shoe manufacturer in China for the next few years. He’d prefer to dispose of the collection to use his share to buy a house in Beijing. The tension rises as two younger siblings disagree with their older brother. Frédéric is distraught, and his driving goes from bad to worse ... even for a Frenchman! Surprisingly few dents in his Renault car. But will he be able to let go if le Musée d’Orsay is willing to take the majority of the collection? It’s a slow, gentle examination of family relationships and dealing with inheritance and how we all build “our own internalised museums”. And despite the obvious riches and artefacts all around, it’s the overlooked and forgotten that turn out to be valuable. The house’s long-time servant Eloise has perhaps most to lose by Hélène’s death. By not voting to keep the collection intact and in-place, her services are no longer needed. Regardless of all she has seen and learnt over the years about the family, she seems the most willing to let go. Her loyalty and faithfulness is rewarded when her old favourite vase turns out to be unexpectedly valuable ... and hers to keep. And the plastic bag containing the broken pieces of a statue that was bust during childhood play has been sitting in a cupboard for 30+ years turns out to be possible to restore. Maybe showing that the relationships that have been stretched and damaged over the inheritance can be repaired too after the passage of time? The film’s bad points? There’s an excessive amount of bird cheeping in the outdoor scenes. As if someone bought the effects CD and wanted to get their money’s worth! And the French dialogue seemed badly out of sync with the actors’ mouths – thank goodness for the subtitles. 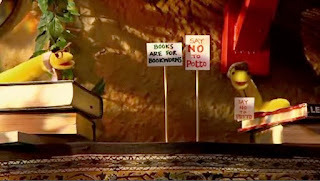 Just as Bernard warned in the animation workshop, there was no zoom in the film. And the film ends as it began, with equilibrium restored and the old house once again bustling with music, talking and drinking. The younger generation – one of Hélène’s granddaughters throwing one last weekend party in the house she expected to be coming back to well into her adulthood. So what does all that have to do with Taiwan? “There’s this view of the passing of time, which you could call ‘Taiwanese’,” explains Assayas, referring to a narrative style which eschews dramatic climaxes, preferring to let events unfold at a real-life pace. So there you go. Don’t say you didn’t learn something by stopping by AiB! Three tweets picked up on Twitter over the last couple of days that made me smile. Editing audio ... Why can't Audacity be more like video editing software? About ten years ago, you could have found me sitting behind the sound desk at the back of a church, where recordings of services were made available on tapes for those housebound (or just unable to make it out that morning). Getting a decent master tape to duplicate was a bit of an art. No point including three minutes of ambient coughing while the collection is taken, or the entire minute of banging and shuffling while the kids go out to Junior Church half way through the service. So a bit of careful pausing and (when remembered) un-pausing. The end of side 1 of the C95 cassettes we used always seemed to coincide with some crucial bit of the sermon (as opposed to a throw away line) and if you misjudged the little dance of hitting Stop-Eject-turn the tape-Rec-Play - there was no auto-reverse button on the deck! - you could lose the main point and make a nonsense of the whole thing. So I tended to record the whole service onto a MiniDisc as backup. I came across my original MD MZ-R30 player recently while tidying up the study - and it started the train of thought behind this post. The MD capture was great, as the MZ-R30 could automatically break the recording into tracks as it went along. Two seconds or more of silence and it would make a new track. So it was pretty fast to skip through the service afterwards, and a piece of cake to label (or title) some of the tracks to mark the start of songs and sections of the service to make mid-edit navigation even faster. Splitting tracks with too much trailing/leading silence was simple, and then deleting the unwanted gaps. And easy to chose a suitable sentence to end side 1 and turn the tape. The only downside of a week when I had to revert to using the MD backup was having to go back and re-record the master tape from it in real time to go off for duplication. Now whether a church service, a podcast or a radio show, editing in chunks is what you want. Self-contained packages of content that can be moved around, cropped, shortened and if necessary reordered. So why is it that tools like Audacity (and I think Garageband - though I've less experience and could be wrong) make editing audio so cumbersome? 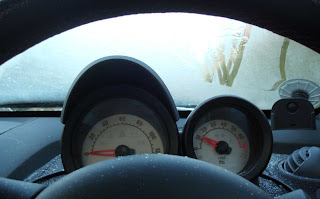 Insisting on (or defaulting to) a single loooong track of sound, navigation is lousy, labelling is difficult, and everything seems to take five times as long as it did on a handheld MD recorder ten years ago. Surely the storyboard metaphor used in video editing software is what audio editors need too? 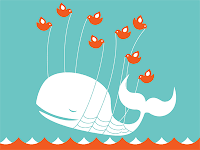 Something to compartmentalise content and decompose it into more manageable chunks? And then once the smaller pieces are refined, and sound effects added in the appropriate places, the timeline can be brought back for final finishing? Maybe I've got it all wrong and am missing the features and usability of the audio tools? If so, I'm sure you'll not be slow to correct and enlighten me! Or maybe you'll agree that when it comes to editing audio that lasts longer than 10 minutes, we're poorly served by the software available. I couldn't resist ... an outsider running for the White House!? Apparently the US Presidential Race is open for an unknown outsider - a kindof common man - to win the grass roots support and beat the party nominations to the White House. Not sure what the weather's like in Belfast, but it's glorious in London. Good move not bringing a rain coat! Other than one tube down from Heathrow to Charring Cross on Tuesday evening, it's been a bus-fest this week. Definitely a lot more pleasant than the Tube in good weather. Except for this last trip. Coming up from Vauxhall to Paddington, the Tube would take 20 or so minutes, compared to 30 or so on the 436 bus. A small price to pay for avoiding the underground metal oven? If only the air conditioning on the bus was pumping out hot air at such a furious rate while the sun blazes in the windows! Now to see what the new Terminal 1 security queues are like - they've recently combined domestic and international security (to allow everyone to browse the international T1 airside shops) - and try to get a seat on the earlier flight home. 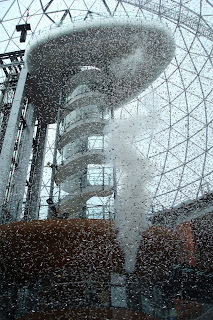 From Monday morning, Northern Ireland's Sesame Tree will be unleashed on early morning viewers on BBC Two across the UK. It's showing at 7.45am for the next couple of weeks. Hats off to Colin and all at Sixteen South who made the programmes. Much of the show's subtlety and local vocabulary might be lost on the mainland audience (who'll be reaching for the subtitles button) ... but at least it'll help them learn to listen to the more pronounced accents. Now, I wonder whether it'll count towards BBC NI's drama or children's network hours totals?! It's all been sorted out now ... with a cheque for £86! The original artist's name? Dan! Dan Bailey. After a couple of weeks off, it’s back to work for me on Monday. So part of today was spent racing around Belfast doing some of the little tasks that are so much harder to cram into your lunch hour. So today, Alan in Belfast found himself lunching in the recently opened Made in Belfast. The menu had a pretty good selection of tantalising dishes on offer. In step with the décor, the presentation of the food was quite fantastic. My burger was served on a wooden board, sat inside an enormous Belfast Bap, and had a cup full of chips! It’s not the cheapest of lunch venues, but the food was good quality, and the service was very good. And there was no quibble when we asked for some tap water. But leaving the food aside for a minute, the décor is quite amazing. Every table and chair in the place is unique. The walls are all different. In fact, there are variations across different parts of the same wall. There’s a huge old-fashioned vertical radiator running across the middle of the room. 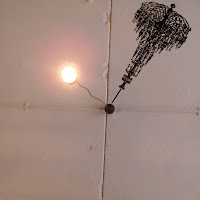 Bare bulbs hang from the ceiling, casting shadows that look more like chandeliers. 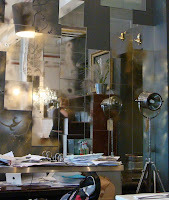 Angle-poise lamps are mounted on the wall instead of spotlights to highlight the “art”. Sections of corrugated iron have been painted to look like wall paper. I can pretty much guarantee you’ll not run out of things to talk about while you wait the short time for your food to be served. From the crowd in from lunch today, it looks to be very popular with teams of work colleagues who don’t mind spending £10–12 for their special lunch. And everywhere you look there are quotes and comments chalked onto black surfaces. It was a week of visiting the Waterfront … and there’s more tomorrow morning! I haven’t quite finished the book yet, so instead I’ll post a picture of Peter Rollins introducing his book The Fidelity of Betrayal: Towards a Church Beyond Belief at its Waterfront Hall launch on Wednesday night instead, and post a review later. 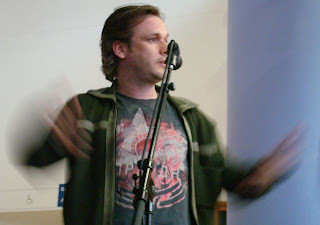 Introducing, simultaneously gesticulating ... and perhaps trying to take off too. I bought my copy from Amazon, so I can assure you I didn’t get it blessed signed on the night! Ciara Chambers (Archive Manager) and Pauline Hadaway (Director) from Belfast Exposed gallery. 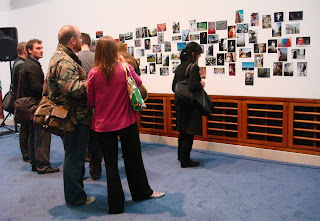 I hadn’t realised that Belfast Exposed grew out of an exhibition of community submitted photos of Belfast 25 years ago. There were no style constraints, with photos chosen on the merit of their content. Mostly black and white, the photos submitted reflected the photo journalistic style of the day. But it formed the basis of their political, social and historical archive. Around 3000 of the photos have been digitised and are available to view (as well as help categorise and comment on) in the gallery, and a subset of a few hundred are up on their website. Hugh Russell is a former Olympic boxer who moved to the other side of the viewfinder and is now Irish News Pictures Editor. Digital technology tightened the media deadlines rather than relaxing them. Hugh Russell was glad that as part of his 27 years at the Irish News, he had the training and background in film, which gives the discipline and techniques that are still used in digital photography. John Baucher (Moochin Photoman) says he is “documenting the present for the future”, taking on commissions, PR work, and gets the occasional shot into the press. He’s currently using a lot of TtV (Through the Viewfinder) where “old meets new” as he takes portraits using a digital camera to snap the image through an older camera’s viewfinder. A picture can explain TtV that better than my words! Pennie Smith is a famed rock photographer who’s not particularly interested in music! The I-shouldn’t-be-so-surprised-but-I-was revelation from Pennie was that she still shoots on film, mostly in black and white, and is still working! And the thought of going back through her back catalogue of negatives and contact sheets and digitising is too painful to begin (except for occasional shots needed for exhibitions/books). While she recognises some of the advantages of digital – particular when shooting in low light conditions, her craft technique and experience with film seems to more than compensate. And while chatting to her upstairs at the exhibition, it was fun to discover that she had a Boots disposable camera in her pocket! Most people present shared the feeling that we’re taking more pictures than ever, but then losing them as no one sees them when we leave them on hard drives and don't print them. Note to self: print quarterly. (Red Mum was recommending blurb.com last night for good quality photo books.) Second note to self: tag photographs on the day they're downloaded from the camera. There was also a feeling that digital photography has made some people lazy (or perhaps bred a generation of lazy photographers). The decision making process has moved from the moment of the event to the moment of the edit. No more expectation to get at six good shots from a roll of film. Digital is cheap and people snap away. Ciara explained that the Belfast Exposed archive find it hard to set their policy around ditching digital photos – particularly with the volume of shots taken by digital photographers, and the tendency for lots of not-quite duplicates to be submitted. Again, a feeling of hard drives filling up shared by the audience. Hugh commented that with black and white, you don’t have the luxury of the medium of colour. Professionals setting up a shot will know in their heads what the final b&w image will look up like when its developed – it’s all about light and exposure. And Pauline added that the slower technology forces people to think before taking pictures, emphasising that photographers need to look at and analyse the shots they take and develop/edit to improve. After the discussion, people moved upstairs to the second floor of the Waterfront to see the Add to Set exhibition. The photos from the eight (?) of us are randomly blu-tacked to the wall, and three projectors throw a continuous cycle of larger images onto a nearby wall. It’s great to see some of the photos blown up so large. They really come alive – compared to the smaller (and quite dark) prints stuck to the wall. Though Adam, some lunchtime I’m going to appear with a guillotine to crop the white bands of some of the photos! There’s no sign to explain what you’re seeing (at least I didn’t spot one last night), so if you wander up to the second floor, it’s a bit hard to know who or what (or even why) you’re looking at. But assume it’s twenty or so random (non-themed) shots from Gingerpixel, Goodonpaper, Mark, Moochin Photoman, Phil, Red Mum, myself and at least one other. We're just a representative (?) sample, a range across the local photobloggers. Lots of other folk really deserved to have a place at the exhibition ... next year? I like my cameras small, much like my cars. So any of the photos you see on the Alan in Belfast blog or flickr feed will have been taken with a pocket-sized camera. Not one of those black XLR jobbies that look professional and have interchangeable lenses. No, a wee Sony Cybershot DSC-W90. 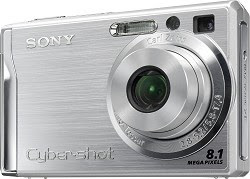 Just a three times optical zoom, though the 8.1 megapizels is more than adequate for filling up a memory card. It lives in my coat pocket. No need to cart around a camera bag. The spare battery weighs the same as three £1 coins, and the spare Memory Stick Pro Duo hardly makes a dent in an already full wallet. So it was a bit of a shock to be invited – along with some more illustrious photographers – to be part of an exhibition running as part of the Trans Festival which has just begun in the Waterfront Hall. I think the last time anyone exhibited by work was as on a display board at school sports day! 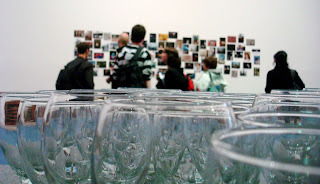 Add to Set will be a celebration of the quantity and quality of Belfast based photo blogs and photographers. Opened by the legendary Rock Photographer Pennie Smith, (the genius behind the Clash’s “London calling” Album cover) the exhibition will be open to everyone and anyone to visit, Launching on the 17th July until the 10th of August. Various technological advances in the last few years have enabled anyone with a camera to share their photography with the world. Some might argue that this has lead [sic] to a devaluing of the art form; however we believe quite the opposite. The exhibition will show both in physical and digital form, photographic works from of some of Belfast’s best photographers, along with a seminar from Pennie Smith and a launch with refreshments provided. Top Floor Gallery in the Waterfront at 7pm on Thursday Wednesday night ... and preceded by a seminar about the future of photography, led by Pennie Smith at 5.30pm 5pm 5.30pm. Despite the embarrassment of being shown up in front of professionals, I’ll look forward to seeing some of you there. After the spectacular opening ceremony and non-traffic jam, the opening of Victoria Square has been somewhat of a slow burn with waves of activity every couple of months. More food outlets opened in May, and this week sees the opening of the eight screen Odeon cinema upstairs on the second floor in the complex. There’s a preview screening tonight, and then doors open to the paying public on Friday 18. The largest screen has 465 seats, with another four between 200-300, and three smaller ones. Four of the screens offer Premiere Seats – in the centre, slightly wider, and slightly more expensive. Evening and weekend ticket prices are £6.20, under 15s get in for £4.20, while seniors and students pay £4.50). Premier seats at evenings and weekends add a £1.50 premium. There’s a family standard ticket for 2 adults/2 children or 1 adult/3 children which offers quite a saving at £15.20 (or £21.20 premium). This weekend, they’re showing Wall-e (U), Chronicles of Narnia: Prince Caspian (PG), Mamma Mia! (PG), Meet Dave (PG), The Spiderwick Chronicles (PG), Hancock (12A) and Wanted (18). Not sure why one stall owner felt it necessary to sell a Peace Keepers toy gun at the Belfast field on Saturday? And not sure whether the Orange Order would have allowed it had they known? Will update if Belfast County Grand Lodge make any comment. 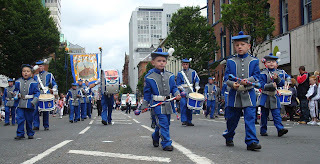 The Belfast County parade was long and colourful, albeit monotonously flute and drum. But the Belfast field was something else. The ranks of Orangemen, led by their hired-in bands, have to march to somewhere. And that somewhere is known as “the field”. Belfast’s field has moved over the years: from Finaghy to Edenderry, briefly to Ormeau Park one eventful year, and most recently settled in the Council’s park at Barnett Demesne (Malone House). As part of our tour, after grabbing a sandwich in Tesco (which was thankfully open for the first time on the Twelfth) we drove up towards the House of Sport roundabout and abandoned our cars down a leafy side street. Sometime after 2pm the last of the parade snakes into the grounds. At 2.30pm, the County officers – sitting on their platform (a big lorry’s trailer) – hold their religious ceremony. After all, the Orange Order strongly asserts its Christian roots and foundation. An inauspicious start! 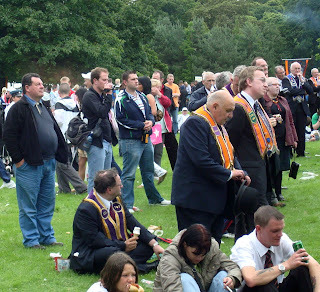 As they began, I counted less than twenty Orangemen standing listening to the service. (They’re quite easy to spot with their suits and sashes.) There were more of us in our tour group listening – and nearly more media –than parading Orangemen. Twenty minutes later, the number of Orangemen assembled around the platform had swollen to around sixty. But still a tiny minority of the hundreds and thousands of hot-footed brethren who had marched to the field. The sermon was unintelligible. Partly a factor of the lousy PA (a couple of old style 100 volt horns on either side of the trailer) that meant it was in no way deafening, and in no way easy to hear above the chatting picnickers. And partly the tone and language that was being used. It didn’t really engage the crowd. Sadly, it reminded me of a bad Sunday School lesson. One where the teacher has completely lost control of the children. But soldiers on, talking over the noise and misbehaviour. They had an offering for Orange Charities, collecting coins from those standing around the platform, but not venturing back into the crowds in the rest of the field. And then it was time to close up with the first and last verses of O Lord Our Help In Ages Past. They passed (announced really) two religious resolutions - Faith and Loyalty - during the service, and then a third political one (State) as part of the public meeting they kicked off at 3pm. In this 90th anniversary year of the signing of the Armistice in 1918, we reflect on those many members of our Institution and the wider community who lost their lives in the First World War. Their loss has a special resonance for the people of Ulster. We bring to mind all those members of Her Majesty's Forces who are currently serving in areas of conflict across the world, particularly in Afghanistan and Iraq. We recall today those many innocent victims of violence in our own land and call for just recognition of the suffering which they have endured. In a changing world, we share the distress of those millions of people who have suffered through the result of natural disaster in Burma and China. We commend the efforts of relief agencies and all those working to assist in those and other distressed areas of the world. The republican movement has orchestrated a campaign of attacks on Orange Halls since 1989 which is still ongoing. We condemn all attacks on our Orange Halls and sympathise with those brethren, north and south, whose property has been damaged. As an Institution we have withstood much and will continue to stand firm for our beliefs into the future. We seek nothing more than civil and religious liberty for all and respect for our traditions and witness. We continue to watch with interest the political situation in Northern Ireland and have reservations about the presence of those in government whom we would not see as democrats in the accepted sense. The ongoing dogmatic approach of some within the government causes us concern as we look to a better future for all citizens of Northern Ireland. A resolution taking in World War One, modern conflict as well as those in need after natural disaster. No mention of Zimbabwe. And a holding statement on the folks on the hill at Stormont. 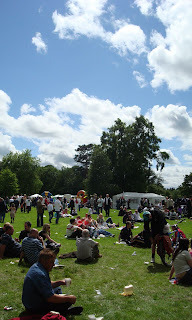 But the real business of the day seemed to be taking place in the queues for the burger vans, in the lodges’ marquees dotted around the field, in the bouncy castles full of kids and in front of the stalls (selling all kinds of tat, mostly coloured red, white and blue). 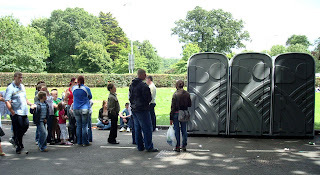 Portaloos had been provided, but the bushes seemed to be bustling with bursting bladders. Aerosols of hair spray were selling well, along with light-up swords. Feel the force! Orange Institution is a Christian organisation. As Orangemen our trust is in God and our faith and dependence is in Jesus Christ, the Saviour and Lord of mankind. Our purpose is to maintain the Christian faith by word and deed; to propagate and defend that faith which we have received from the Church of the New Testament through the faithfulness of the Protestant Reformers. It is Christ-centred, Bible-based, Church-grounded. By it we are moulded in character and conduct. The Orange Institution is set for the defence of Protestantism. This is true to the intention of Orangemen who are committed to the Christian faith with its Reformation emphasis on a personal relationship with Jesus Christ as the Lord and Saviour of mankind. There are also the Protestant beliefs in freedom of conscience; the priesthood of all believers and the primary place and purpose of the Holy Bible in Christian faith and conduct. We proclaim "Civil and religious liberty for all : special privileges for none". We do not deny to others their civil and religious liberties; we expect the same tolerance from them. We shall be strong for truth, for peace, for the making of a good, fair and just society to which we shall contribute liberally as good citizens. The Glorious First? Witnessing the Belfast parade. Until this week, I wasn’t aware that the Twelfth would have been commemorated on the first of July (Battle of Boyne = 1 July 1690 Julian calendar) if it hadn’t been for the British adoption of Pope Gregory’s shifting of the calendar in 1752! A year later in July 1691, the Battle of Aughrim – my old house at school – was won by a battlefield fluke when the Jacobite general (who was winning at the time) was unexpectedly decapitated by an even more unexpected cannon ball, throwing the Jacobite forces into disarray and allowing the Williamites to take advantage of the panic. As regular readers will have realised, AiB doesn’t offer much comment on politics. But we’ve been on a bit of a cultural tour this weekend with about 20 others. (Happy Birthday mapgirl!) A run through Irish history before taking in the bonfire at Pitt Park and then moving onto the huge East Belfast blaze at King George V Park beside the Oval. And the next morning, a briefing on the Orange Order, the history of the Twelfth parades, and the particulars of the Belfast one. Perched on a traffic island in Bedford Street there seemed to be few references to the mostly European troops that fought at the Boyne and at Aughrim. Though along with Lord Laird’s slightly-surreal float and its military models, there were a lot of old uniforms and flags from the period around the Somme being worn and waved as the parade moved through the streets. From brief memories of a parade in Lisburn some 25 or more years ago, the Orangemen’s dress was a lot less formal. Young folk paraded – even carrying banners – in jeans and ordinary tops. If you were over 25, suit and tie did seem to be the order of the day. But few bowlers hats, and even fewer black umbrellas. In contrast, the band uniforms are particularly smart, again drawing on older military dress to back up the legacy UVF flags that are often being carried. But the look felt more sinister than historic. There were even a couple of women’s lodges joining the main twelfth parade, which used to be an all male affair. Apparently the Belfast County parade is too long for pipers, so pipe bands tend to save their breath for the shorter country marches. Belfast is the poorer as a result. No pipes. No silver bands. Just flutes and drums, drums and flutes, and a couple of accordion bands. Turns out that lodges have to hire in the band that marches in front of them. In many cases, that means that the 15-30 men are paying out £2000+ to employ a band with 40 or more players for the day. Even more expensive if they need to travel across from Scotland. An expensive business to keep up appearances in the main parade. The Sash – which wasn’t in fact worn at Aughrim or the Boyne, as the Orange Order didn’t exist until 1795 – could only be heard twice from our vantage point. Twice during a two and a half hour parade. So while the bands may have lacked instrument variety, they had a wide range of tunes at their disposal to stop constantly reverting back to the best known loyalist ditty. There was a lot less alcohol under the deck chairs that lined the route than I expected. And where we were standing, very little sign of underage drinking. (A different story up at the field.) So perhaps the Orange Order’s requests for an alcohol-light parade – in keeping with their desire to re-brand the march and its surrounding events as Orangefest – had been heeded. While I heard stories about the police getting spectators to empty out their alcohol into the drain, I didn’t see it happen. But there was certainly no sign of any Orange marshals interacting with the crowd. Maybe next year the Orange Order will move on to a zero-tolerance litter campaign. The rubbish and glass bottles strewn across the pavements and roads, particularly in the busy areas from Shaftsbury Square onwards (well away from the BBC’s cameras at Bedford Street) was phenomenal. So the criminal offences around alcohol weren’t the only ones on hold for the day. Valid vehicle licence plates didn’t seem essential to drive on the roads. (Unless every lodge has really bought and registered plates starting LOL ___?) But sticking the lodge number over your normal number plates (front and back) or wrapping a plastic bag around them (perhaps to disguise the number) was the order of the day. Later on that afternoon, driving back along the dual carriageway at Knockbreda, lots of the cars were driving back home along the road, still using their LOL plates. Reflecting back on the Belfast parade, I suspect the Orange Order has some way to go before the march will be truly accessible to those outside the institution, its politics and its traditions. The youth and size of the bands is in stark contrast to the growing age and decreasing size of the lodges. And the Orange Order’s slowness to modernise isn’t going to help secure its future. 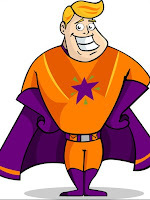 Having launched their Diamond Dan superhero, why didn’t he make an appearance at the flagship Belfast County parade. 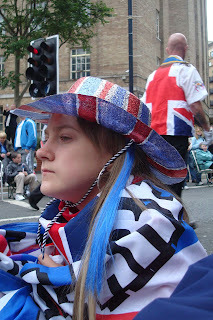 What would it have taken to pay for someone to knock up a costume or ten, and plant Disney-like characters up and down the parade route to reach out to the youngsters sitting on the pavements of Belfast. A lack of imagination – or an unwillingness to change? There'll be another post about the field, a plenty of pictures over on Flickr. 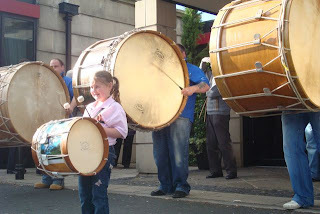 When I was living in Lisburn, the eleventh night was accompanied by the blattering of Lambeg Drums. Blatter blatter blatter. For hours on end until the bonfires burnt low and people slipped away to bed. 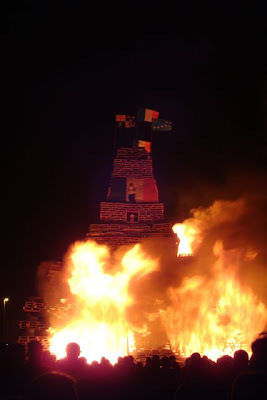 After the earlier show of culture at the launch of Orangefest (including Lambeg drums, thankfully outside the hotel), there was no such display at the main East Belfast bonfire last night. 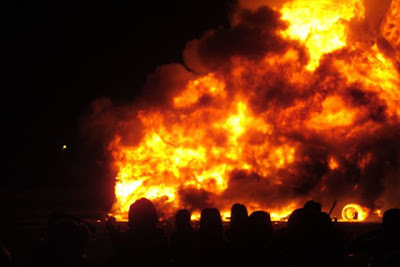 The only music came from the techno disco van parked well to the left of the bonfire. So the remix version of The Sash echoed out across the park rather than anything more authentic. And that seemed to echo the overall feel of the night. A sense of non-engagement. Watching the fire, but not really caught up in it all. 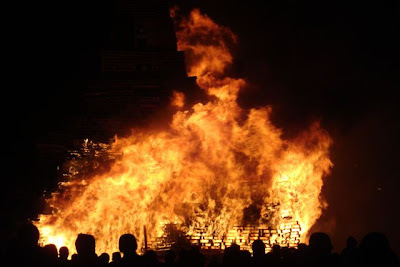 While some obviously nimble and gutsy folk had build the enormous bonfire (perhaps bigger than they’d experience of before? ), few of the spectators seemed to be to bothered by what was going on. Yes there was a bit of a cheer when the Gerry Adams / Sinn Fein election poster caught fire. Yes there was a bit of a cheer when the dummy representing the Pope (and carrying a small “Don’t burn me” notice) finally lit. And yes there was a larger cheer when the Irish tricolour burnt melted (polyester doesn’t really burn, just shrinks away). But I’d expected the cheer to last for ages and to have some passion in it. But they must have been saving their passion for the next goals being scored in the next door Oval football ground. Sectarian? Yes. Acceptable? No. But extreme hatred? Not really. And perhaps it’s a sign that it won’t be too long before it’s omitted the nationalist and republican trappings from the annual Twelfth narrative. Anyone for a game of "Spot the ball burning tyre"? Having a Swiss journalist staying with us this week has been perhaps a timely excuse to discover a bit more about the history, culture and diversity of this bit of the world. The kind of stuff you normally leave to books and newspapers. It’s easy for some to live in Belfast and never drive up the Falls or the Shankhill. You can even live in East Belfast and drive up and down the Upper Newtownards Road without ever managing to park the car and get out on the lower bit, the actual Newtownards Road. I’ve also lived in East Belfast for three years and never had an excuse to go into the Park Avenue Hotel! 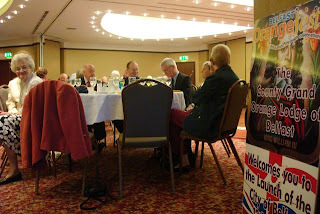 So on Tuesday night, it was a trip to the Ballymac centre for their Somme evening. Our guests had spent yesterday talking to all kinds of people in all kinds of areas of Belfast. But last night we all headed across to the Park Avenue Hotel. Orangefest is normally launched in Belfast City Hall. But due to the refurbishments, they’d had to skip their traditional venue and reroute to East Belfast. Picture about eighty well dressed men and women, mostly over 55, sitting drinking soft drinks (there was a lot of orange squash). I wasn’t too sure how true the statement was, though last year’s SDLP Deputy Lord Mayor was in attendance. 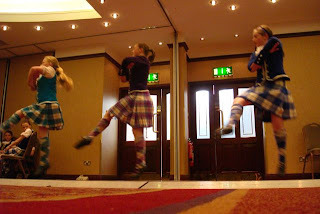 Displays of Lambeg drumming – outside this time which made it easier on the ear! 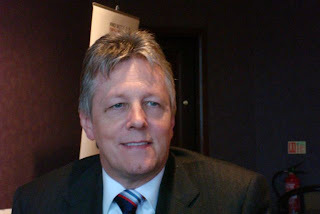 A speech by the First Minister Peter Robinson – who isn’t actually a member of the Orange order, and managed to keep his “few words” to something shorter than his 7 hours 31 minutes filibustering record from Stormont. 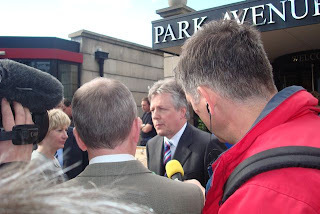 In an interview secured after the words, music and sandwiches were over, the First Minister claimed that the Orange Order had “been a stable force in Northern Ireland” and shown “responsible leadership”. Asked about the longevity of the current power-sharing arrangements, he suggested that the current model of four parties (sorry, Alliance) securing four different electoral mandates and then coming together to deliver the lowest common denominator was not sustainable. Over time there would have to be a gradual shift to “normal democratic means of government”. An interesting evening, with the Orange Order desperately seeking to change image through the soft, fluffy Orangefest (though no obvious mention of their super hero), yet maintaining their (at times) masonic-like titles and arcane vocabulary.